The Service Chiefs and other heads of security agencies who met with Buhari at the Presidential Villa, have kept mum. 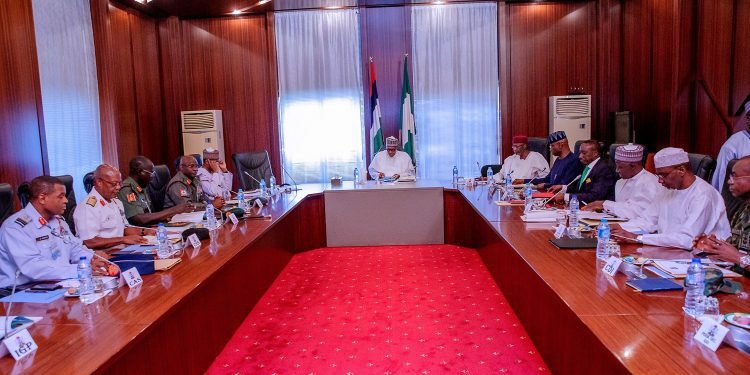 According to Sun News, it has been revealed that after three hours closed-door meeting with President Muhammadu Buhari, the Service Chiefs and other heads of security agencies at the Presidential Villa, Abuja, none of the participants agreed to comment on what transpired. Unlike previous meetings where the acting Inspector General of Police, Mohammed Adamu, would brief the press, none of that happened this time around. Rather, the participants engaged in bulk passing. Those in attendance were the Chief of Defence Staff, General Gabriel Olonisakin; Chief of Army Staff, Lt. Gen. Tukur Buratai; Chief of Naval Staff, Rear Admiral Ibok Ekwe Ibas and Chief of Air Staff, Air Marshall Abubakar Sadique. Others are the National Security Adviser, Babagana Monguno; Minister of Defence, Mansur Dan- Ali; Minister of Interior, General Abdulrahaman Dambazau; Director-General of the National Intelligence Agency (NIA), Ahmed Abubakar; acting Inspector General of Police, Mohammed Adamu and the Director General of Department for State Service (DSS), Yusuf Magaji Bichi. The Secretary to the Government of the Federation, Boss Mustapha; Minister of Interior, Lt. Gen. Abdulrahman Dambazzau and the Minister of Defence, Brigadier Gen. Mansur Dan-Ali were also part of the meeting. INEC Chairman, Professor Mahmood Yakubu, had in a statement condemned what he described as the role played by some soldiers and armed gangs in Rivers State which he said led to the disruption of the electoral process. INEC said the action was an attempt to subvert the will of the people. The electoral body said this was part of the submissions made after the commission set up a fact-finding committee to assess the situation in the state. Following reports of widespread violence and other forms of intimidation in the state, collation of results and other activities for the governorship and state assembly elections were suspended on March 10. In the run-up to the elections, Governor Wike had consistently accused the army in Rivers State of bias and being used to interfere in the state’s politics and ultimately influence the outcome of the 2019 general elections in the state. At a time, the governor alleged that soldiers from 6 Division, Nigerian Army, trailed him in Port Harcourt with the intention of assassinating him. The allegation by Governor Wike was, however, dismissed by the army. While the collation of the March 9 governorship and House of Assembly elections was underway, soldiers and policemen clashed at the INEC collation centre in the Rivers State capital, an incident that ultimately hampered the collation exercise, in addition to other infractions recorded at various polling units. This prompted INEC to suspend the electoral processes in the state. The United States-Nigeria Law Group, an election observer initiative, on Monday released a damning election assessment report of the 2019 election, clearly stating that most of the issues that troubled the 2019 general elections were deliberately contrived to assist the ruling All Progressives Congress (APC) to retain power at the centre. The group said it observed conscious efforts to compromise the elections and raised early warnings as well as concerns, which have now been validated.